OnePlus 6T McLaren Edition will be launching at an event today in Mumbai. OnePlus 6T McLaren Edition is going to be launched in India today ie Wednesday. On Tuesday, this phone was launched in China. This new edition of OnePlus 6T has 10 GB RAM. The new phone comes with the company's new Fast Charging Technology Warp Charge 30. OnePlus 6T McLaren Edition has a carbon fiber pattern on the rear and the McLaren signature on the bottom of the smartphone. There are also some other accessories related to McLaren in the box. 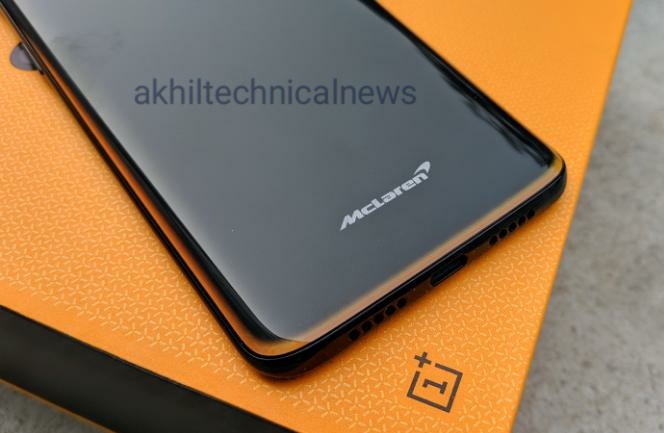 The price of OnePlus 6T McLaren Edition is 649 Great Britain Pounds (around Rs 58,800) in the UK, which is more than the midnight black variant of OnePlus 6T's 8 GB / 256GB storage. Its current top model costs Rs 45,999 in India, so it is expected that the potential price of OnePlus 6T McLaren Edition in India can be Rs 50,000. Carbon fiber has been used under the glass on the rear panel of this special edition of OnePlus 6T. The body of the phone is black color and the lower edge is McLaren Papaya Orange color signature. Warp Charge 30-sided Papaya Orange Color Cable also comes with a smartphone. As the name implies, 30 means 30 watts faster than charging. The company claims that within 20 minutes the phone is charged for the entire day. Explain that the regular variant of OnePlus 6T is equipped with 20-watt fast charging capacity. OnePlus 6T McLaren Edition is a 20-megapixel Sony IMX376K secondary sensor with 16-megapixel primary Sony IMX519 sensor and aperture F / 1.7 with aperture F / 1.7. There may be 4 more super slow motion video records from the camera. The rear camera is equipped with dual-LED flash with OIS and EIS. For amateurs of Selfie, the phone has a 16-megapixel Sony IMX371 sensor, which is equipped with aperture F / 2.0. A front camera is supported and it is possible to video recording at 1080 pixels.